hello just received my ar57 and i noticed out of the box that the bolt face is putting indents into the barrel is this normal? Got pictures? How to post pics instructions are linked in my sig line. I just checked mine and I do not have that issue. I would recommend you contact the manufacturer and they will make it right. That is definitely not KOSHER. Did you call them and ask them what's going on? Any way they could test another new one (in an actual AR57, not bench mode) before sending it to you AGAIN? At least then you'd know if it was a factory thing or your own gun that causing it. well got the upper in all looked good so i cleaned it up ran a patch down the barrel oil it then cycled a few rounds and now noticed the necks on the rounds are getting pushed down happened on all three rounds i tried they went from a OAL of 1.5850" to a OAL of 1.5730" so there chambers are also out of spec. 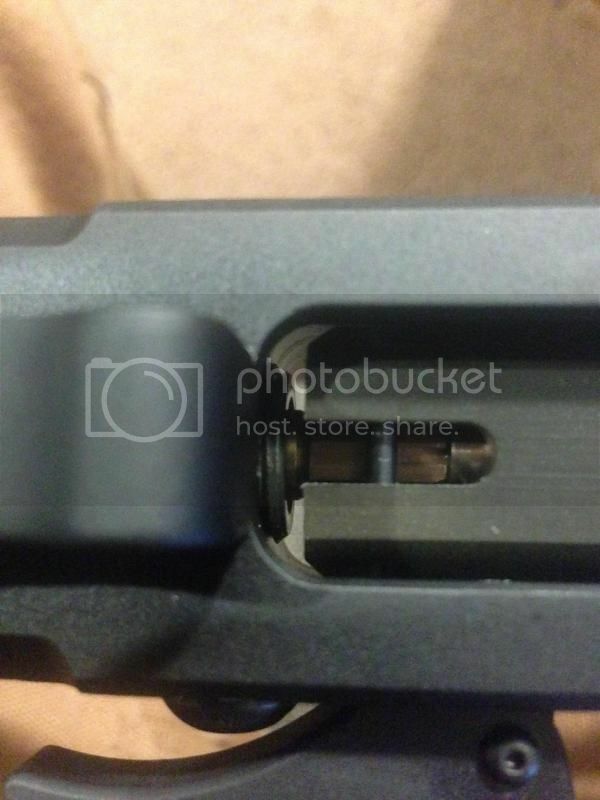 the last upper also had this issue i didn't notice until i went to measure some rounds. 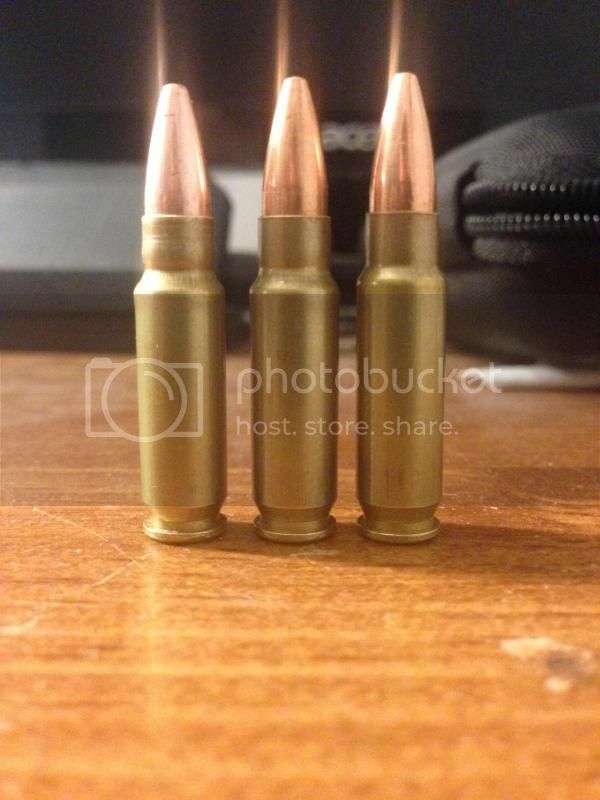 i contacted them again this will be the 4th upper there going to send and i have the feeling it will be the same way because all the uppers they have sent have looked the same with a round loaded into it i am uploading 2 pics so you can see. 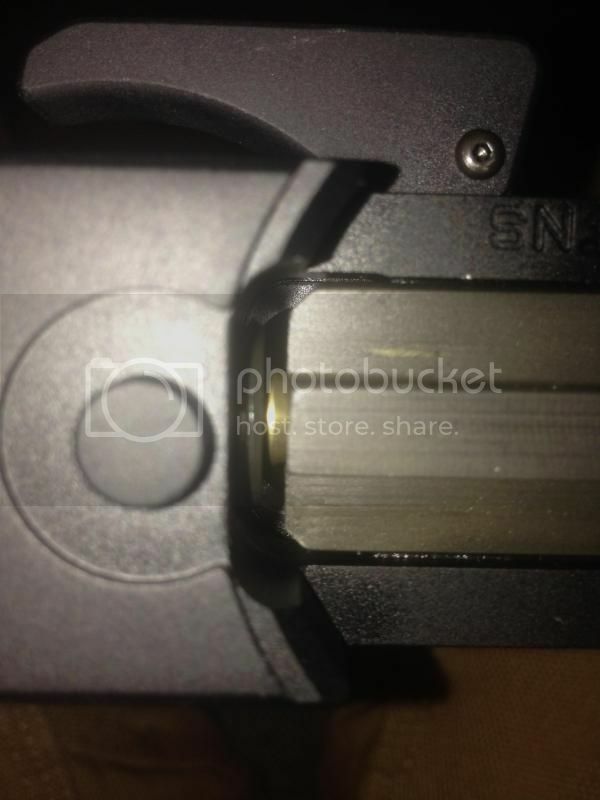 now if you look at the picture you can see that the bolt is not contacting the barrel so my thinking is the round is getting slammed into the barrel and it's causing the bottle neck to get pushed into the case causing the shortened round. what do you guys think? Last edited by scottl1346 on 07 Jan 2015, 20:35, edited 1 time in total. You've been more than patient...I'd send this back and demand that my money be refunded. It's pretty clear they're currently unable to perform proper QC on their products and there's no reason to risk injury from their products. What manufacturer is this? I'm in the market for an AR57 upper and would like to avoid these guys! kfeltenberger wrote: You've been more than patient...I'd send this back and demand that my money be refunded. It's pretty clear they're currently unable to perform proper QC on their products and there's no reason to risk injury from their products. You have shown admirable restraint by not flaming the manufacturer. Politely ask for a refund. well received a call from jeff at ar57 HQ and he personally fired and checked out the upper hes sending me. hopefully this will be it and all issues fixed. i did send those pictures to him and he said the bolt is not supposed to contact the barrel why i don't know doesn't make sense to me. he also said the tolerances look good but he couldn't tell without it being in his hands. hopefully this is it if i have any probs with this upper im going to ask for a refund and ill use that money to finish the 308 I'm building. Well, having been on the fabrication side of things at one time, I can attest that things can and do go sideways despite all good intentions. At least they appear to want to make it right. Good luck. When I bought mine, I went directly to their office. I live about 2 hours from their shop. They made a point to say if I ever had any issue to call or bring it in and they would make it right. I am glad that they have shown you this much help. It shows that they are truly concerned for their product and care for the consumer even though you had bought it from another distributer. 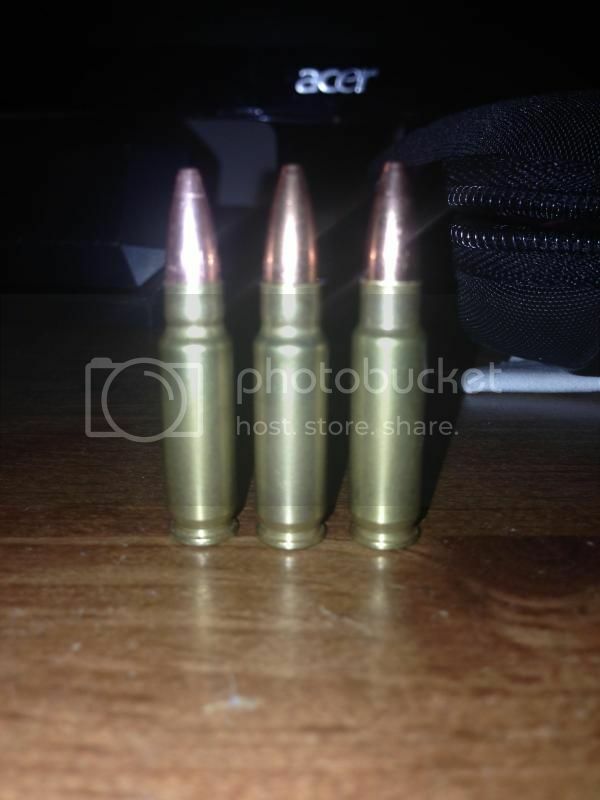 heres a couple pics of the rounds 2 left ones have been chambered and the 1 right round has not. 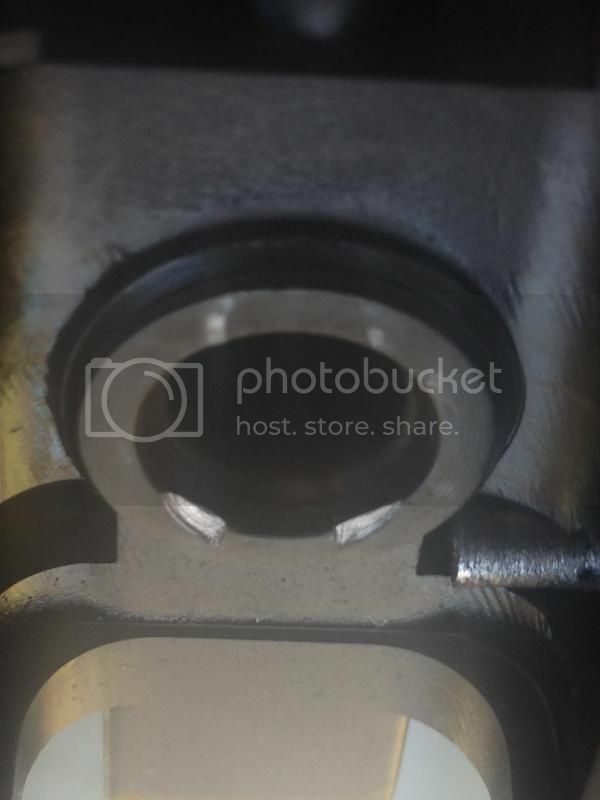 i think the weight of the bolt and the spring pushing it foreword and nothing to stop the bolt its just ramming the round into the barrel messing it up iv had a couple pieces when extracted they had the bullet fall off. you all might want to check your uppers and see if this is happening the change in the brass could cause it to be over pressured.